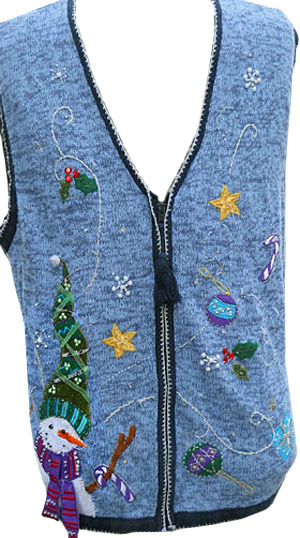 Ugly Tacky Christmas Sweater VEST! 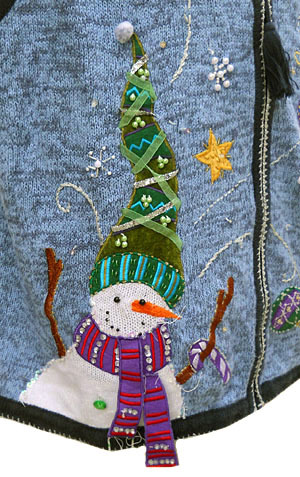 Heathered medium and light blue background, with navy and sparkly silver trim---the right side has a fantastic and happy snowman with a red & purple scarf that hangs off the bottom, and a pointy wavy velvety hat with beading and ribbon on it! The other side has stars and candy canes and ornaments, and gifts strewn about! Zip front. Tagged White Stag. Ramie/Cotton. Condition: Very Good. Has s large light brown-ish stain on the front. Still a great holiday sweater. Priced Accordingly!